UPDATE - BREAKING NEWS! This is probably another case of "the black men did it" lie. Congratulations to law enforcement for taking gunpowder residue from the murdered baby's mom and her man, who was recently arrested for throwing furniture and accusing his baby's mother of murdering the child. 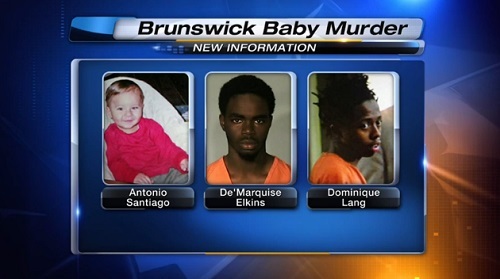 On March 21, 2013, a 13-month-old baby boy was killed in Brunswick, Georgia. Sherri West, the child's mother, reported that two black youths attempted to rob her during her morning stroll with her baby. West alleges that she was shot in her right thigh and her son was killed in retaliation because she had no money. A Glynn County grand jury indicted De’Marquise Kareem Elkins, 17, and Dominique Demetrius Lang, 14, regarding Antonio Santiago's murder and other charges related to the baby's death. West reportedly identified the teens from photos. Police also arrested the accused teens' mother and aunt and followed a lead to find a gun in a lake. Ballistics from the gun will be compared to the bullet that shot the baby. The news report regarding recovery of the gun did not disclose who provided information as to where the gun was. The indictment says that on March 22, Katrina Elkins provided a false alibi for Elkins by reporting he was at her residence during the shooting. The indictment also accuses Karimah Elkins of providing a false alibi for her son, as she told police he was with her during the shooting. West also had two other children: a daughter and son. Her son died by stabbing in an altercation with another teen in New Jersey when he was 18. West's daughter, Ashley Glassey, was removed from her mother's custody at eight years of age, but she speaks with her mom regularly by phone. Glassey questions her mother's story about the baby's death. See an excerpt from the ABC report. Glassey says her mother is bipolar and has schizophrenic tendencies. Glassey said she started to have her doubts after receiving a phone call from her mother telling her that her brother, Antonio Santiago, had been killed. She claims that on the night of the shooting her mother asked, "How soon do you think life insurance policy will send me a check?" Glassey said she has contacted the Brunswick Police Department and no one has called her back. Criminal charges against Yvonne Hickman were dropped three years later. In her lawsuit against Glynn County officials, which was dismissed without trial, Yvonne alleged that officials committed fraud, and she submitted documents to prove it (legal documents bearing what was passed as Yvonne's signature that she denies having signed). Should people be arrested and banned like Yvonne Hickman was, or prosecuted like the two black teen suspects in baby Antonio's murder are, purely on the word of a mentally ill witness? The Bible says no. "In the mouth of two or three witnesses shall every matter be established"
The 59-year-old commissioner was charged with influencing a witness and obstructing law enforcement in an investigation, the Glynn County Sheriff's Office said. Brooks was arrested Thursday, posted $5,000 bond and left jail Friday afternoon. He simply told the defendants' mother and aunt they had the right to remain silent when being interrogated by police about the murder investigation. Evidence may prove that Elkins and Lang are indeed guilty of attempted robbery and murder. If so, the teens absolutely should be imprisoned (the district attorney has announced he will not seek the death penalty). But all defendants deserve the presumption of innocence until proved guilty in a court of law unless they confess and forego trial. There is apparently no forensic evidence tying the black teens to Antonio's murder. There was no claim that the gun retrieved matches ballistics of the bullet fired into Antonio. West, a mentally disturbed woman, was the only witness to her baby's murder, just as Nathaniel Hickman was the only witness to being savagely run over repeatedly by his wife in a car, from which he miraculously emerged unscratched. Mr. Hickman, pictured above, never sought medical attention for being run over by his wife's car and continued to make regular trips to the gym. Nevertheless, Yvonne Hickman was arrested and banned from Brunswick, Georgia. Mr. Hickman underwent foreclosure, as he relied on his wife to handle the finances. He is currently homeless, and the couple's home in a predominately Caucasian community was repossessed by the bank. Ms. Hickman continues to seek justice in court regarding the destruction of her marriage, her arrest and enforced removal from her home, and related issues. 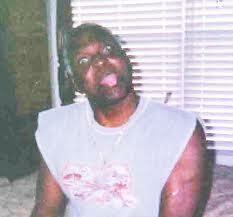 How much credence can the justice system give testimony by mentally ill witnesses?